Oakhurst Neighborhood Association, Fort Worth, Texas: Little Free Library Coming to Oakhurst - Your Books Needed! 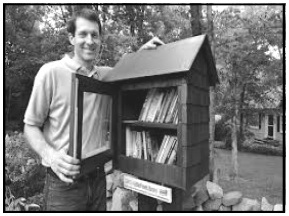 Little Free Library Coming to Oakhurst - Your Books Needed! "The Little Free Library started with a lone outpost in Hudson, Wisconsin and has snowballed into a feel-good national phenomenon that packs literacy, neighborhood bonding, civic pride an artistic creativity into one tidy package," wrote Steve Campbell in the Fort Worth Star-Telegram in July 2012. When I saw this article, I thought it would be a perfect fit for our neighborhood! To build more than 2510 libraries around the world! Our library will be located at the west end of Daisy (thanks to Linda Plemons!) This will be a 'take a book, leave a book' or 'take a book and return it when you are done' system. I need your help to get this project off the ground. We need books! If you have any books you think others would enjoy reading and would like to donate them, please call me at 817.319.3614 or drop off on my porch (2121 Yucca). We need adult and children's, fiction and non-fiction, just anything you think others would enjoy reading! Since the library is for all ages, please make sure books are appropriate. For more information, check out the website www.littlefreelibrary.org. More details to follow! Bike Ride with Mayor Betsy Price TODAY!